Hello Sanrio Store Visits in Tokyo! Aside from flying on the Hello Kitty plane, visiting Sanrio Puroland and staying at the Hello Kitty hotel room one of the most memorable things I did in Tokyo was visiting the five recommended Sanrio stores in Tokyo. Sanrio Japan has a list of all the Sanrio stores in Japan and there were five they featured and recommended. It became my goal while visiting Tokyo to visit each and every one. My first visit was the Sanrio Gift Gate Ikebukuro Store. Located near the JR Ikebukuro Station and near Sunshine City in Ikebukuro is this two story Sanrio Gift Gate. It’s a really cute store with a staircase that features Hello Kitty inspired paintings on the wall and a large Hello Kitty plush at the top. My next Sanrio visit was the Hello Kitty Japan in DiverCity Tokyo Plaza! This is located in Odaiba and I really enjoyed this store because they Odaiba specific items. One of my favorite souvenirs was a Hello Kitty Japan Odaiba tote. I also liked the Hello Kitty Japan in DiverCity because they had Hello Kitty cafe selling Hello Kitty pancakes, donuts and drinks right next to it! I next stopped at Hello Kitty Japan at Tokyo Skytree Town Solamachi. Tokyo Skytree in itself is an amazing place to visit because it is the world’s tallest tower at 634 meters! There are various stores and restaurants but the Hello Kitty Japan of course was my favorite to visit. My fourth Sanrio visit was the Sanrio Gift Gate in Shinjuku! This one had a cool looking store front because there is a gigantic Hello Kitty mosaic statue! Last but not least was my Sanrio visit to Sanrio World Ginza. Ginza is considered to be one of the most expensive, elegant and luxurious streets in the world and Sanrio World Ginza is equally elegant with a special sparkly entrance with Hello Kitty and My Melody made out of Swarovski. This is the largest Sanrio flagship store in the world and this store is two stories. The lower floor is dedicated all to Hello Kitty and includes a Swarovski Bling Me Shop as well as nail shop! The Swarovski shop inside Sanrio World Ginza is truly special and filled with many beautiful items. Mission accomplished in visiting all the Sanrio Japan recommended stores! Each store is was uniquely kawaii in their own special way. I loved visiting them all and it made my Japan trip even more special. For more smiles, please see my Yelp review on Sanrio Gift Gate Ikebukuro, Hello Kitty Japan Odaiba, Hello Kitty Japan Tokyo Skytree Town Solamachi, Sanrio Gift Gate Shinjuku and Sanrio World Ginza. Hello Kitty Terminal in Taipei! Taking the Hello Kitty Eva Air Jet to Tokyo meant a layover in Taipei, Taiwan! Located at Terminal 2 of the Taoyaun International Airport is the Hello Kitty Terminal. For a Hello Kitty fan like me, it was instant Hello Kitty heaven the moment I saw it. The first thing one sees is the bright pink Sanrio store. There is a lovely display of the cutest Hello Kitty goods including some exclusive Taiwan Sanrio items. There is also one giant Hello Kitty Aviator statue right up front. The Hello Kitty Aviator seems to be the mascot of the terminal as she appears everywhere from the decor on the walls to plushes sold. Next to the Sanrio store is the waiting area for the terminal. It includes bright pink seats as well as two play areas for children. It also has a “rainbow” step carpet with a tv that is playing a Hello Kitty cartoon. I love all the details of the terminal. The walls are super kawaii. I also like the circular windows that feature Hello Kitty Aviator in different poses. The Hello a Kitty Terminal was the perfect terminal to make a stop during my Hello Kitty dream trip. 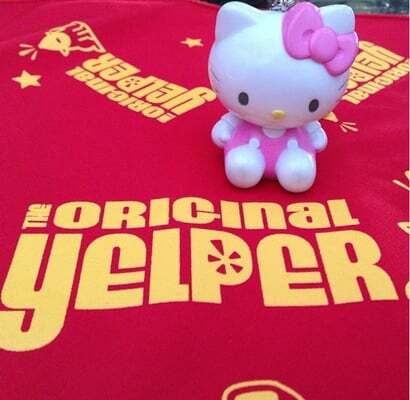 For more smiles, please see my Yelp review on the Hello Kitty Gift Gate at the Hello Kitty Terminal in Taipei. Today is a very special day! October 1, 2018 marks the launch of the very first collaborative collection of skincare and beauty products by Crème Shop and Sanrio! This collection includes a total of 51 items and each will feature one of our favorite Sanrio characters; Hello Kitty, Keroppi, Gudetama or Chococat! One of my favorite items from this collection is the Hello Kitty Handy Dandy Cream in Apple Blossom! I’m always on the go during my Hello Kitty Foodie adventures and this cream made with Shea butter and Vitamin E is great for helping the skin feel nourished throughout the day! I love the touch of rose and apple too. 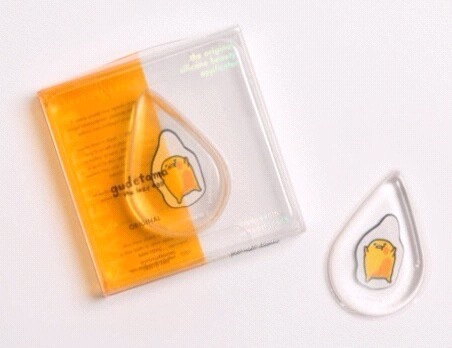 Another amazing product is the Gudetama macaron lip balm! There’s nothing meh about this lip balm. It’s perfect for keeping lips soft and decadent; just like a macaron. As the day wraps up and my Hello Kitty Foodie adventures come to an end; I simply want to relax. This is right time for the Hello Kitty tea time sheet mask. This is a black tea sheet mask that is rich with antioxidants. It’s great for moisturizing. Prices for this collection range from $4 for the face masks to $10 for the hand creams. The collection is currently available online at Sanrio and at Crème Shop. It is also available at Sanrio Japanese Village. Mid-October it will be available as well at Hot Topic and Riley Rose and next January 2019 we will see it at CVS, Dolls Kill, FYE and Cost Plus. Back in April of this year, I shared the happy news about our favorite Sanrio Panda, Aggretsuko getting her very own Netflix show. Throughout season 1 of Aggretsuko; we all laughed, cried and raged on with Aggretsuko. I know when the first season ended, I was about to go through my own rage session…how could this cool show end? Well, thankfully there’s no need to go to into the Den of Rage and have a raging karaoke session because Aggetsuko will be back for Season 2 on Netflix in 2019! During this year’s Anime Expo, Sanrio and Netflix, made the exciting announcement that there will be a season 2 coming this 2019. There’s already a teaser for season 2 which can be seen: here. When Aggretsuko made her global debut on Netflix on April 20, 2018; we all fell in love with her day-to-day story as an office associate in the accounting department of a trading company in Tokyo. We were a part of her journey as she faced daily stresses and conflicts in a comical way. Season 1 streamed on Netflix worldwide, was dubbed in 8 languages including English, Chinese, Spanish and subtitled in 23 languages including Chinese, Korean, English and Spanish. This season 2 expect to laugh a little more, relate even more and rage on and on because Aggetsuko is back to grind! Hello Sanrio x 64 Colors! This July 9, 2018 will be the launch of the brightest, cutest and newest Sanrio collection! Hello Kitty Foodies say hello to the Sanrio x 64 Colors collection! This new collection features art work of some Sanrio’s beloved characters. We’ll find cute apparel and items with classical characters such as Hello Kitty, Pochacco, Deery Lou. Artist Duo 64 Colors mixes the texture of screen-printing with the smoothness of flat blocks of color. The retro style design is too cute to miss! To celebrate this wonderful retro-inspired collection, Sanrio and Box Lunch will be having a fun event on Saturday, July 7 from 12-3pm! It will be a first look at this unique offering . The first 100 guests will be gifted with limited edition mini posters with original designs. There will also be Hello Kitty Cafe treats and a very special appearance by Hello Kitty herself! I hope to see you there :). Hello Kitty Foodies, I am so excited to share the latest collaboration of Sanrio. 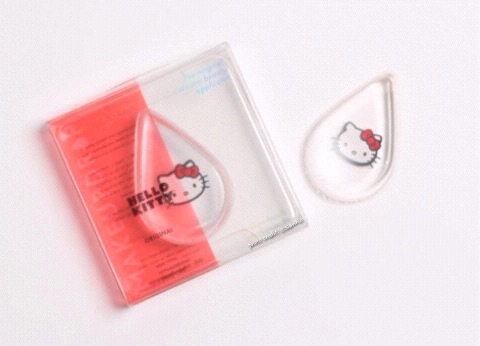 Sanrio has teamed up with Makeup Drop to bring us two supercute versions of their easy to clean silicon beauty applicators. One features our favorite Hello Kitty! Hello Kitty, hello pretty! Th other has our egg friend Gudetama. There is no being lazy applying makeup with this! Gone are the days of washing out beauty blenders in the microwave and in are these cute tools to evenly apply foundations, moisturizers, blush and more. Not only are these cute, they’re Eco-friendly too! The MakeupDrop x Hello Kitty and MakeupDrop x Gudetama are available now for $20 at Sanrio, Bloomingdale’s and Resolve!